A reader comment by Dawn ("Selkie needs to know that an octopus isn’t a fishy, but a cephalopod.") inspired the cephalopod bit. The desk guy just kept staring and saying "uuuhhhhh" in my original draft. Thanks, Dawn! I’m really hoping this trip ends well, because we have a string of freaked out people in the last few strips. With that said, Sai Fen is really starting to grow on me as a character. She’s the right mix of maternal and snarky, and she has great interaction with the other characters. She also seems to know her way around public far better than her husband, even though his job puts him into contact with people on a far more regular basis. Now that I mention it, I’m honestly curios; what type of lifestyle did Sai Fen live before she became a stay-at-home mom? Being snarky requires a subtle blend of humor with a dash of rudeness. You would need to be extremely fluent with the respective culture to pull it off. In Sarnoth she was a sculptor by trade, which she still does now. Watching Suko (and soon Tai Li) has slowed down her sculpture output but she still makes time for it when she can. Before becoming a stay-at-home mom she would meander the city when not sculpting. Visit art galleries, walk in the park, loiter in a bookstore, etc. She also likes FPS games, sniping specifically. It never occurred to me that they would have computer games in Sarnoth. I *think* Dave meant, in the time since she moved to Calumet. You don’t know that! Maybe there is a budding gaming culture at the bottom of the lake. With all the cool glowing high tech stuff, I’m sure someone must have invented the concept, especially with the holographic projection that they have available. Still, it would be funny if, with all that technology, the most cutting edge in video gaming ends up being a Sarnothi version of pong. The bottom of a lake is where most of the games I’ve wasted good money on belong. That would be post-Sarnoth. They’ve been “topside” at least long enough for Pohl to earn a medical degree. All of which can be countered or multiplied by a person’s level of reality blindness. Geez, Sai Fen. I get your point, but no need to be so aggressive about it. The poor clerk is obviously freaked out, which is totally understandable under the circumstances. Intimidating him (and coming close to threatening!) is really not civil or helpful. She wasn’t really threatening him, just poking him to get him out of his reverie. Someone without the “smile of death” would probably resort to knocking on the table or touching the guy’s shoulder. In my opinion, the guy isn’t staring and frightened because the de’Madeias look weird and predatory in general. Hahaha, Mort, you’re made me laugh! Cephalopod, it rolls off the tongue, but rarely swims onto mine– I usually need a fork. Cephalopods like to stick to the tongue! And throat. And teeth. And cheeks. And chopsticks. Totally. Especially considering octopi have been known to escape their tanks to go a-hunting. They’re here to free their fellow intelligent aquatic brethren! THEY WILL COME FOR US ALL. *cackle* Yes! THE SHARK PEOPLE! THE SHARK PEOPLE ARE GOING TO EAT ME! Per your transcript: Definitely much better. I could see someone in the middle of a freakout grasping for anything stable. And calling an octopus a fish is likely a pet peeve of the desk clerk, so he was probably running on autopilot. Per the staring: My wife and mother in law have a condition (congenital nystagmus) that makes their eyes VERY “shifty” or “googley”. She gets all sorts of BS questions that annoy her (sometimes they anger her, and a few have almost brought her to tears.) It’s not a condition that can be “fixed.” Short of cloning new eyes for her and doing a transplant, she’s how God made her, and going to stay that way. But I’ve personally seen the gamut from “Are you drunk?” (2 fratboy types) to “Dear, you need some glasses.” (The 90 year old lady at a church we attended). It wears on her. I can sympathize. Nobody wants to be looked at like a carney freak. on the staring: totally agreed. I’m surprised at the number of comments trying to defend the guy staring and questioning when I’m pretty sure “its rude to stare, honey” is a trope that parents say to kids. Because it is rude to stare and comment on stuff like that. Its rude because it wears on people. Rude doesn’t make someone evil or a demon or less of a human or anything; its just bad behavior that our bodies naturally do if we don’t actively take measures to minimize it. 1) Generalize. Go to a place like yahoo answers, or a forum, or somewhere where you’re not speaking to anyone in particular and just post. Some people will bite, and a few will give good details. It’s also a good way to get in touch with people whom you can question further. 2) Make it clear that you have good intentions (Writing a story), and aren’t trolling, or trying to push a political agenda. 3) Be courteous. Use polite and professional language that doesn’t address the medical condition in a negative way. 4) Go on youtube and watch some videos about people in similar situations. There are lots of documentaries from TLC, Discovery Channel, etc. out there where they spotlight people with medical conditions, and interview friends and family. Even if the subject of the documentary doesn’t have your character’s exact condition, watch it anyway. There are a lot of common threads among the different challenges these people face. Sierra J’s advice is awesome. 1) Self educate before asking for help. A lot of medical conditions have forums or support groups. Sometimes there are support groups for care givers. Go read what these people say to each other. Read it silently (don’t comment, just read). Learn about them as people. Learn what upsets them enough to rant about. Learn how they treat each other. 3) Try not to assume things when you ask questions, or ask leading questions. It both tampers with your data quality, and exposes your own biases (steriotypes are sometimes percieved as rude). General questions can be great for this. Such as “what would you want to tell someone whose family member recently was diagnosed? What do you think they should know?” instead of “how does ___ kind of care giving impact your family?”. Along similar lines, people with the same condition can have drastically differently impacted lives depending on their situation and symptoms. If you want the complete story, try to represent both of these situations. I think people often only tell the most extreme story, and that makes things difficult for people who are just differently abled and don’t need or want a cure, versus people who are disabled and really would like the situation to change. 5) Offer something in return. A thank you in the published work. A gift card (if you have that kind of funding). A chance for them to ask you personal questions. But some kindness that shows you understand the effort they put in to answer these questions. Seriously, this is the point at which my ability to give this comic the benefit of the doubt runs out. This kid is obviously freaked – he’s seen nothing like this before. Why would he not immediately call every major news organization and let them know that ALIENS are walking around his aquarium? Maybe that’s the direction Dave’s going. That’s possible. It’s going to come out eventually, but they need to keep the secret going a bit longer. Speaking of which, surely the Sarnothi have made it into the Enquirer by now, right? That one magazine that puts equal weight of Hollywood couples divorcing, people enjoying a beach without having a good-looking body, and Bigfoot evidence for reals this time? The one that Men in Black said was the one place to get good news about aliens because it was out in the open but nobody believed it? Also, this makes me wonder if anyone born with actual webbed hands (because that sort of thing is possible, if I recall correctly) has ever decided to play it up instead of down and started dying their skin or something. One of the premises of the tragically-only-got-one-season series The chronicle is that every wacky tabloid story is true and they deliberately make the stories seem like a joke in order to keep people from harassing the subjects of the stories. Covering up the truth by telling the truth so loudly everyone ignores it. Sure, but stories like the ones you’re mentioning aren’t picked up because there does not exist concrete evidence. Take a picture or video with your phone, upload it to the internet. Hell, if these people walked around a block in a big city, the same photos would be uploaded hundreds of times by different people and before long, major investigations would be started and the government would be forced to acknowledge their existence. Photographic and video evidence still wouldn’t be enough to convince everyone that the de’Madeias aren’t just people in costumes. You need to backup that claim if you’re going to make it. Why wouldn’t they? Look up body modification sometime. 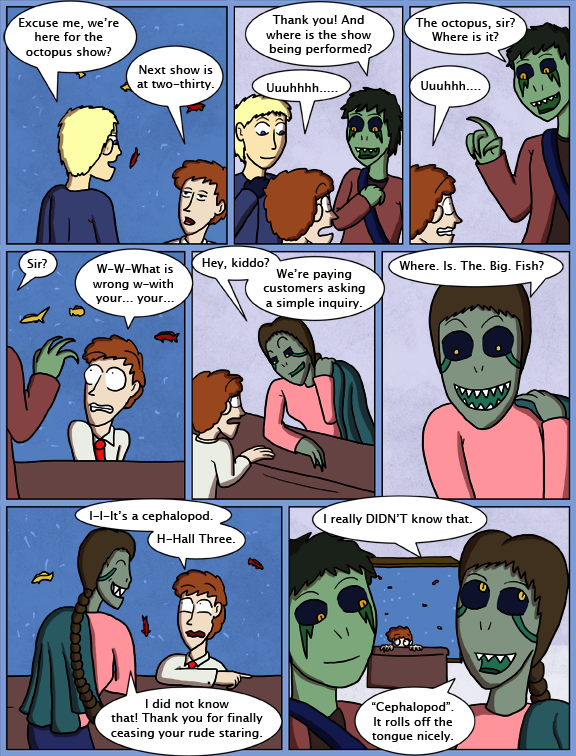 People like The Lizardman, Catman, and The Tentacle Man do exist IRL, and if the Sarnothi started standing out too much then it might be reasonable for the government to field it as a story about a family that was heavily into body modification. I’m sure a couple of those radio shows that encourage any and all alien/conspiracy theorists to call in would definitely be give him all the air time he needs to tell everyone that aliens just walked into his public aquarium. And a lot of them are, like the cover story for the Sarnothi, major medical conditions. Seriously. People don’t tell because they’re assuming it’s a medical thing (hence why these people are out walking the streets), especially if asked, and it’s INCREDIBLY RUDE. You’re assuming that the relevant government entities don’t have the media on lockdown where the Sarnothi are concerned. My comment inspired some dialogue? YAYS! I wonder if Selkie will actually eat the octopus or not. It does taste delicious. Once when I was little, I went to Whole Foods and one of the workers in the seafood section tried to freak me out by offering me a free sample of raw octopus. Naturally, I said “Sure!” It was really good, but the Whole Foods worker was weirded out that I actually ate it. Did it try to escape? I read that raw octopus, even when cut up, will try to climb out and that people have gotten injured by the suckers. Well, an octopus has brains inside their tentacles — their intelligence is spread over their entire body — so the idea of part of the tentacle moving after being cut off isn’t unreasonable. I doubt that would happen unless it were very fresh, though, like cut off a couple minutes before serving. Probably not how it gets served in the store. Nope, it wasn’t still moving. It had probably been dead way too long for that. I’ve had octopus sushi before. It didn’t taste bad (it tasted kinda like coppery seawater, the way a lot of seafood does), but the texture was odd. It was like chewing on a chunk of rubber. Given that In the arts community people often will assume unusual forms of dress and appearance, Sai Fen’s appearance may have been unquestioned among its members. Since this seems to be only a mid-sized Midwestern city, the arts community may be fairly close. There is a possibility that Sai Fen may be that acquaintance of or may have befriended a certain conceptual artist who recently regained custody of her young daughter. i doubt that they know each other, since Andi wouldn’t have been SHOCKED to see a photograph of Selkie for the first time. I love Sai Fen’s snark. I feel like she was rather rude here. Sure, he was ‘staring’ although to me it seemed less like staring and more like dumbfounded or shocked at what he was seeing, but that’s no reason to accuse someone of being impolite. I once saw a girl who was either born without or somehow lost her nose, so she had a hole where her nose would be. I instantly found myself very much wanting to get a better look, but instead looked away. I saw other people stealing glances or doing a double take. It’s not rude, it’s just human nature. Hell it’s not even rude to ask. Better to ask and gain some knowledge or understanding rather than remain ignorant to the situation. I feel like most people would rather get it out in the open instead of beating around the bush and having people try and be ‘polite’ by avoiding the situation. Like, you know all your friends are thinking, “Hey why do you have a big gaping hole in your face what’s up with that?” But instead everyone awkwardly and nervously avoids the subject leaving you to ponder what they’re really thinking. Anyways I think what she did was rude and completely unecessary. So is gasping and stammering at someone who, as far as you know, isn’t comfortable with that treatment. Since the young man in question was obviously not going to be able to correct his behavior on his own, pointing it out to him could have been enough to shock him out of it and remind him of the manners he should have learned in kindergarten. To paraphrase: Looking surprised or startled is fine. Open mouthed gaping is not once someone has hit the “age of reason”. Given my observations, I would guess that to be around 45. My mom’s friend once said that when you meet someone with a disability, you should gently acknowledge it and then move on with the conversation. It’s a tactic that lets your brain relax about the “elephant in the room”. However, a person with unusual characteristics that they have no way to change is subject to a lot of these reminders that they’re not normal. It may be the only time you ask them about it, but it may be the twentieth time they’ve been asked about it just today, and that’s not even counting the build-up from the rest of the week and from their entire life. It’s not unreasonable for them to get sick of being reminded of it. Nor is it unreasonable for them to go “You know what, I don’t have to stop and explain myself to every human being I pass. That is not my problem. If I made sure that everyone I meet knows enough about me to understand what I’m going through, I’d never have time to get *anything* done.” And so to decide to just not deal with it. Seriously. I can sort of pass for neurotypical on good days, but I still get tired of the people asking “where are you from, what’s your accent?” (Same as regional, I’m just autistic) or staring at me in line on bad days. When it’s a daily thing, and constant? That would be beyond exhausting. I do not blame Sai Fen in the slightest. I can, kiinda, see her point with the, “thank you for ceasing your rude staring”. But I just betcha that the first time she saw PINK people, with FLAT teeth, ROUND eyes, NOSES AND EARS, without WEBS, she stared. “What the hell are them things?!?!? Seems like more people would be aware of them, though. The first time Pohl interacts with the Smith family, he is wearing bunny ears. 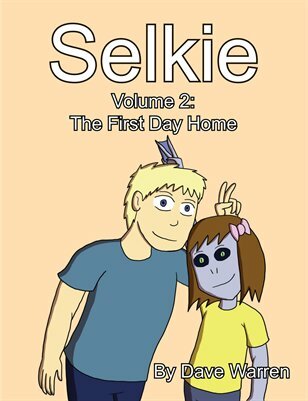 https://selkiecomic.com/comic/selkie367/ He said that he knew his appearance was scary, and the bunny ears helped to NOT traumatize the kids. Now, if he works with human kids, then, obviously, human kids have seen him. And if human kids have seen him, then human parents have seen him. At least, I don’t give my kid to the doctor and tell him, “Here, take her in the back room and do whatever, while I wait out here in the lobby with a magazine”. No – if my kid’s in with the doctor, then I am also in with the doctor.